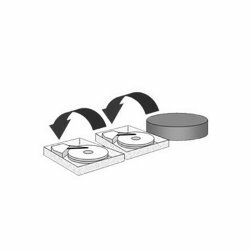 For those who have more than a few old hard drives lying around or simply need bigger storage here’s how to combine multiple hard drives into one volume that’ll hold: movies, TV shows, music, photos, games or other files. In general, there are three ways for combining multiple hard drives, we’ll try to explain how to do each, and their pros and cons to one another. The easiest way to combine multiple drives is to use symbolic links (similar to shortcuts). This option allows you to store a folder on your second drive, create a symbolic link to it on your first drive, and it’ll feel like all the files are on that first drive. You can perform this on just about any operating system, including Linux. Windows users can also mount an entire drive to a folder using built-in features. Google for instructions on your specific operating system for more information. This method’s biggest advantage is that it’s easy, and allows you to control the location of each specific file or folder. It also works with any number of drives, speed and capacity. If one of your drives fails, you only lose the data on that drive, and the other drives stay intact. The biggest disadvantage to this option is it can get to be very annoying and tedious if you need to do this with a lot of files or folders. Spanned volumes refers to an option in which volume starts at the beginning of your first disk, and ends at the end of your last disk, creating one giant volume. This is often also referred to a JBOD or Just a Bunch of Disks. In most operating systems you usually open disk management utility, mark the drives and select an option to create one. Spanned volumes are a little different in every operating system, but the process of creating them is similar. Linux users can use a feature called LVM or Logical Volume Management. The biggest advantage over symbolic links is that spanned volumes are much easier to manage. It just shows up on your computer as one big drive. This option works with any number of drives, capacity and speed. The biggest issue with spanned volumes is that they introduce a greater probability of drive failure. If you have a volume spanned over three drives, that’s three drives that could fail instead of just one, and if one of your drives fails, you lose all of the data in that spanned volume. We don’t recommend this option for most scenarios. However, in case you have a lot of data that isn’t very important or is already backed up you can use it with no worries. RAID 0 combines multiple drives into one big volume. This method works in very different way than spanned volume and instead of filling up one drive and moving onto the next, it writes data across all of your drives simultaneously. Its read speeds are faster than with a spanned volume, but if one drive fails, then you lose all your data just like with spanned volume. 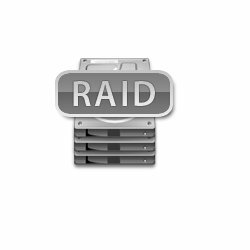 RAID 1 doesn’t combine multiple disks into one big volume, it implements a concept called mirroring. Your second drive is a mirror of your first one so that if one fails, you have data on the second drive. RAID 10 combines the best of RAID 0 and RAID 1. Long story short you create a mirrored array and then combine that with other RAID 1 arrays for one big, mirrored volume. This type of RAID requires quite a few disks, and can be quite costly so it is out of scope to this article. RAID 5 introduces a feature called parity. Unlike RAID 10, RAID 5 can store recovery data in much smaller parity bits, spread across your drives. That means you can use more of your drives for data and hopefully save money. There are several ways to create an array. In most cases it will involve a software implemented in your motherboard and in which the process of creating it is no different than creating a spanned volume. In case you use a specific hardware to create an array it may involve more research or a hand from skillful friend. In general, the advantage of RAID is that it offers the ability to turn multiple drives into one, big, often fast volume without worrying about losing your data. In case of RAID 0, it does not provide this redundancy, but is still faster than a spanned volume. Downsides to an array are: drives have to be the same size and speed or you’ll have to make some sacrifices. It may be pricey since it isn’t ideal if you have a bunch of various disks and you’re trying to save some money. But, if your data is important, it can help keep data safe, except in case of RAID 0. Recovering of data in almost any case can be tricky business and not having a proper backup is also another subject. But, in case you have bunch of disks just lying around hope this article can help you put them in good use.